This pineapple upside down pudding is deliciously sweet. Preheat the oven to 180°C/fan160°C/gas 4. Grease a deep 32 x 22cm baking dish with butter and line with non-stick baking parchment. Pour the golden syrup into the tin, tilting the tin to evenly spread the syrup. 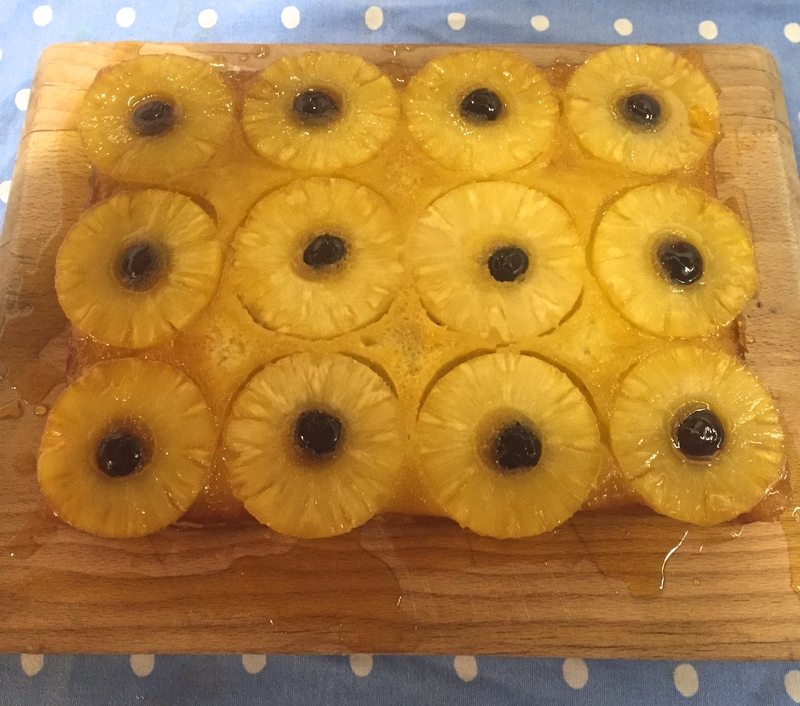 Arrange the pineapple rings over the golden syrup in 3 rows of 4. Place a glacé cherry in the middle of each pineapple ring. Place the butter, sugar, flour and baking powder in the bowl of a food processor. Lightly beat the eggs, milk and vanilla essence together and pour into the processor bowl. Blitz for 1 minute until thoroughly blended. Spoon the mixture into the tin and level out with a palette knife. Bake for 35-40 minutes until golden and a skewer inserted into the centre, comes out clean. Leave to cool in the tin for 15 minutes. Turn out onto a serving plate or chopping board and cut into slices. Serve warm with custard.